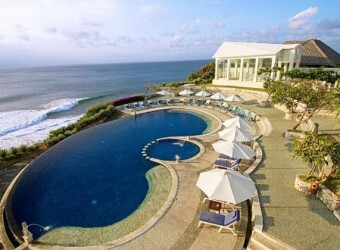 Bali Hotel Blue Point is the ocean front villa that is built on Uluwatu Cliff. They have ocean front Presidential Villa, 2-storey Villa, Honeymoon Villa and Deluxe Room, etc. There are an ocean view restaurant and a glass building wedding chapel. From the main pool, you can the great horizon without any obstacles.